Have you ever accidentally stepped across the foul line in your excitement to throw a strike, only to receive nothing but embarrassment and shame from those around you? First of all, we’d recommend getting more supportive friends during this mishap, but second of all, we’d behoove you to learn more about bowling etiquette before you go and enjoy an evening out on the lanes. After all, you’d hate to be the person who screws up someone else’s perfect game just because you threw your ball at the same time. Here at Lucky 66 Bowl, we really value when our patrons know the rules and etiquette of bowling. Whether you’re looking to join the latest bowling league or you’re just looking for the best bowling alley in Albuquerque, we’re the “bowling alley near me” that you can trust for a fun, enjoyable time. 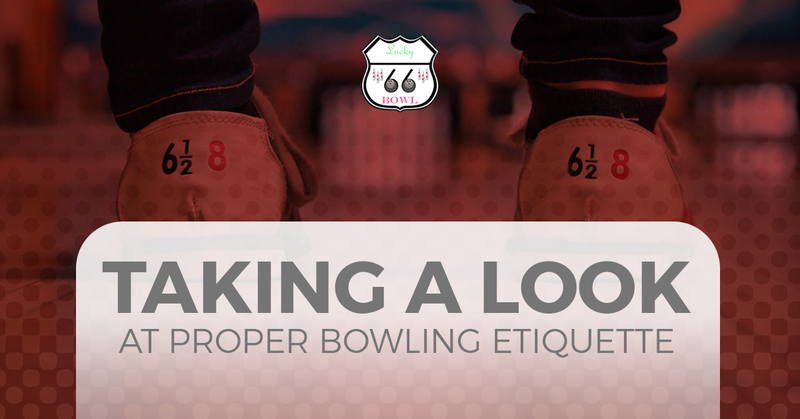 Read on to learn more about good bowling etiquette, or feel free to get in touch with Lucky66 Bowl today if you have any questions. Remember how you learned about the importance of sharing and taking turns during preschool? Those rudimental life values also apply here. When a bowler gets on the approach and there’s someone on either side of them, the general rule is that the first one on the approach bowls first. You want to avoid bowling at the exact same time as someone next to you, as this can be distracting for many people. Don’t necessarily delay other people in your group or even future groups waiting to use your lanes. Whether you’re in a committed bowling league or you’re out for a birthday party celebration, please pay attention to whose turn it is. If your buddy is getting a little distracted catching up with someone else over a beer, politely remind them that it’s their turn to bowl. Once you’ve delivered the ball and it’s rolling down the lane, there’s this tendency for people to think that body language will somehow knock down more pins. Unfortunately, this only works in theory. After the pin(s) have been knocked down (hopefully, at least), leave the approach area for the next person to bowl. Always make sure to stick to your lane and your lane only, being careful not to encroach on someone else’s lane. Bowling is a relatively simple game, albeit being difficult to consistently execute. Really, by being respectful of others as they bowl each frame, that’s about 90 percent of bowling etiquette right there. If you take anything from this post, just make sure to be courteous and respect other bowlers by staying on your lane or seating area. Always wear bowling shoes when out on the lanes, and don’t disrupt other bowlers during their turn. Get Your Game On With The Best Albuquerque Bowling Center! As long as our patrons follow basic bowling etiquette, everyone is guaranteed to settle in for a good time. So, strike bad etiquette away from your scorecard and come on down to our bowling lanes here at Lucky66 Bowl! Read more about us here. Learn More About Bowling With Us!